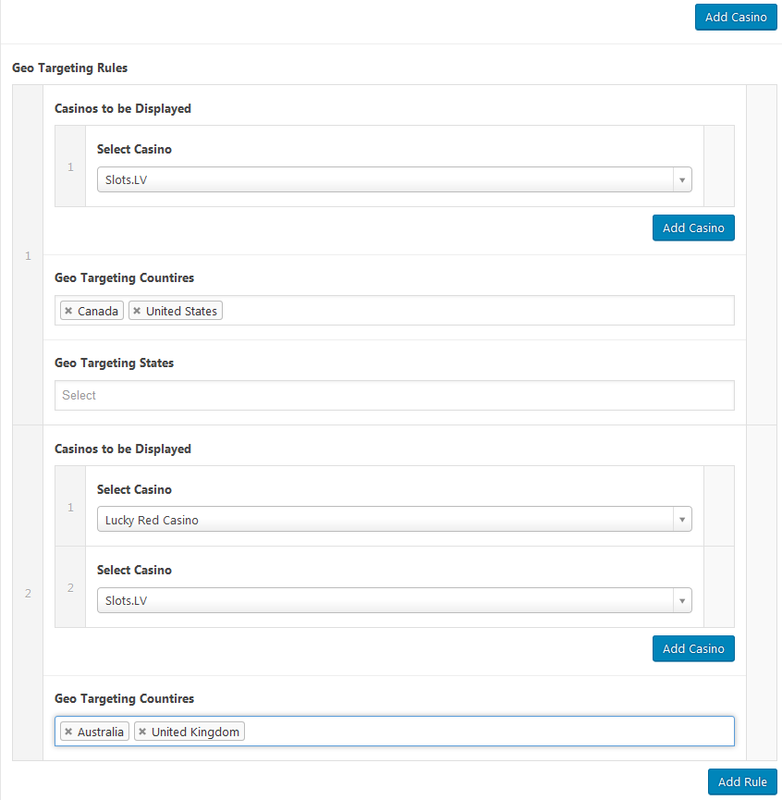 We are pleased to announce a major update to our Gambling Review Plugin, which now includes built-in geo targeting for countries and US states. This is a great feature that can increase conversions by showing US casinos to US visitors and another set of casinos to other visitors for example. Also included in this update is another variation of the casino shortcodes, in which you can add review cards. Geo targeting is available for all casino shortcodes within the plugin. Note: You will need to setup your casinos again with this new version. 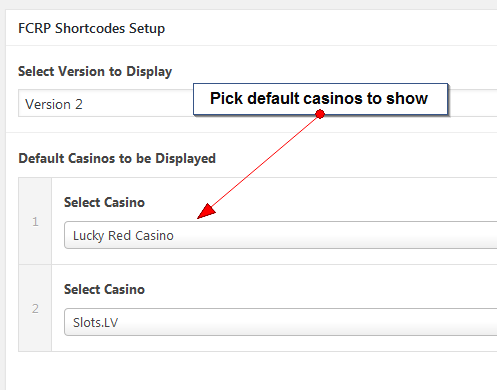 You can select a default set of casinos to display to start with and then select any geo targeting rules. 2. Select default casinos to show. These will be the casinos that will be displayed if no countries are matched or the IP address is not found in the database. 3. If you wish to geo target your sites, select Add Rule under Geo Targeting Rules. 4. Select the country or countries you wish to geo target by. Then click add casino to add the casinos that will show for visitors matching those countries. Note: You can also select US states to geo target by when selecting United States. 5. If you want to add another set of casinos and countries, click add rule again. Repeat process until all rules have been added. Geo targeting database is provided free by Maxmind and uses the Geolite database. Flytonic does not provide any database or data for the geo targeting. 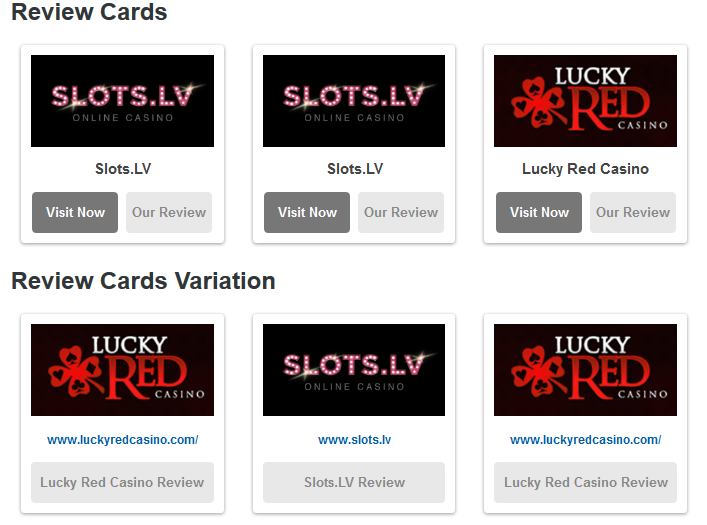 You can now display your sites or casinos in a card type display by selecting the Review Cards version when setting up your shortcodes. Review cards can be selected when creating the shortcode under versions. There are also options for removing the visit button and displaying either the url, bonus, or site name. You can download version 1.4 in your downloads area or purchase here. You will need to setup your shortcodes again after update.